A French official says sounds detected by search teams in the Atlantic depths are not those of Flight 447's black boxes. The aide to France's top transport official, Jean-Louis Borloo, says the "black boxes have not been detected." The aide spoke on condition of anonymity because she was not authorized to be publicly named. She said Tuesday that French military ships searching in the area where the plane crashed have "heard sounds" but that those were not signals from the flight's voice or data recorders. Earlier Tuesday, French newspaper Le Monde reported that French ships had detected a "very weak signal" from the black boxes. 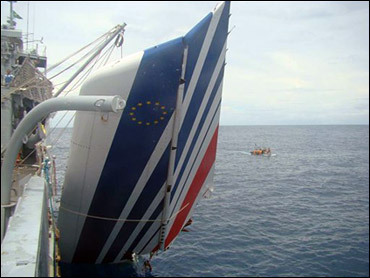 A newspaper reported Tuesday that French naval vessels had detected a "very weak" signal from flight data recorders, or black boxes, of downed Air France flight 447, which plunged into the Atlantic on June 1. Le Monde said on its Web site a mini submarine was being sent to try and retrieve the vital aircraft components at a depth of some 5,000 yards, but the recovery was being hampered by strong currents. The Airbus A330 crashed into the ocean during a flight from Rio de Janeiro, Brazil to Paris, killing all 228 passengers and crew aboard. Ten of 50 bodies recovered from the flight have been identified as Brazilians, medical examiners said Monday. CBS News correspondent Elaine Cobbe reported earlier Tuesday that the French Transport Ministry could not confirm the report that the flight recorder had been localized. A ministry spokesman told Cobbe that the mini-sub is dispatched to the ocean floor any time they get any indication that might suggest a location for the black boxes, and it has already been dispatched several times during the search. Investigators cite broken limbs sustained by the victims whose bodies were recovered in drawing their preliminary conclusion that the aircraft broke up in the air before plunging into the southern Atlantic. Recovery of the black boxes has been the central focus of the search effort, as information contained in the recorders should be able to shed further light on what downed the passenger jet. Locator beacons on the data recorders are designed to emit an auditory "ping" for about 30 days after a crash which can be detected, even under water, from about a mile away. Cobbe reports that the submersible being used in the search is called the Nautile, a three-man vessel belonging to IFREMER, the French Institute for Marine Research. It is capable of plunging to a depth of almost 20,000 feet. It's the only sub in the world that can go that deep. Air France, Brazil's air crash investigation authority and IFREMER all declined to comment on the report of a detected ping Tuesday, referring questions to the French Transport Ministry.